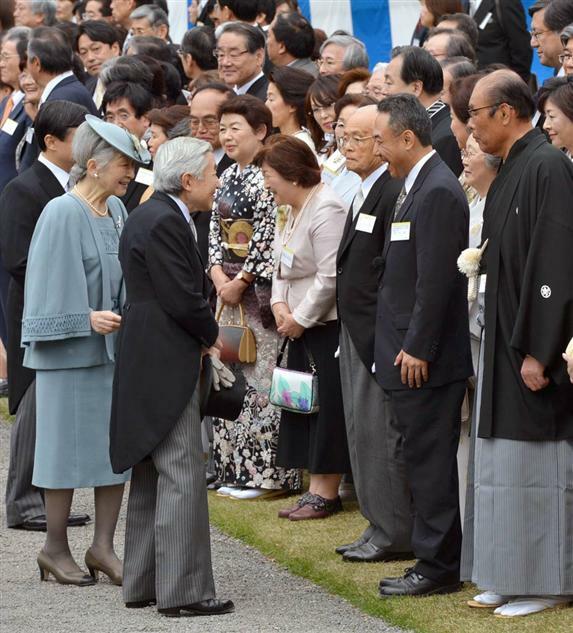 The Spring Imperial Garden Party was hosted by the imperial couple of Japan at the Akasaka Palace in Tokyo on this April 19th. 1956 people in total who have made remarkable feats to society were invited to the party, such as Satoshi Furukawa, an astronaut who completed tasks at International Space Station, a sumo stable master Hanaregoma who is an ex president of Nihon Sumo Kyokai (Japan Sumo Association), Yoshihiro Murai, the governor of Miyagi prefecture which is a damaged area of the huge disaster last year, and others. 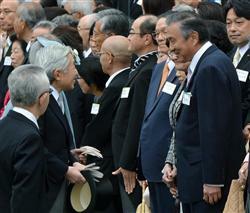 These are some of the conversations between the Emperor and the attendees; The Emperor asked Furukawa if his health condition was good after the mission at ISS, and he replied saying he was getting better and almost perfect and he would keep training to support his future mates who would go to the outerspace. The Emperor gave Hanaregoma words of consolation as he needed to take up the burdens to solve problems in the sumo world during his office, and he thanked the Emperor saying things had settled and expected better developments from now on, when he received his words of that he expected the sumo world to have more new excellent sumo wrestlers. The Emperor asked Murai how the life in the temporary evacuation houses after the heavy snows in this winter was, and he replied saying they had made implemented sufficient measures to protect people from the cold climate and hard days were still going on but he would do his best to improve the situations. The Emperor told him he had heard the rubble contained some dangerous parts and asked him to handle them with good care. 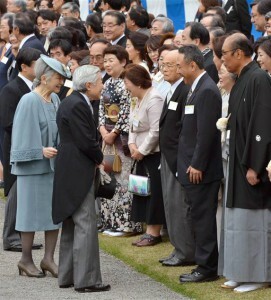 The Emperor gave words of appreciation over the supports to Japan by Taiwan upon the disaster to Hyo Kitai who is the representative of the representative office of Taiwan in Japan (;effective ambassador) that was the very first representative invited to an Imperial Garden Party. The Emperess also talked to the Kitai’s wife in English. That was the very first conversation between the Emperor and a representative of Taiwan after 40 years since the breakup of diplomatic relations. Such a garden party is usually hosted by the Emperor and the Empress twice a year ,one is in spring and one in autumn. 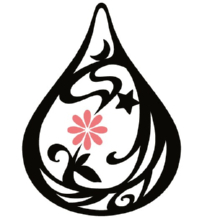 However, there was no spring garden party last year due to the huge earthquake and tsunami disaster. And the Emperor had undergone a coronary-artery bypass surgery on Feb 18th and was hospitarized for a while. He had a long break until the week before the garden party and the party was the symbolic event of his come-back to his official activities and recovery from the disease.